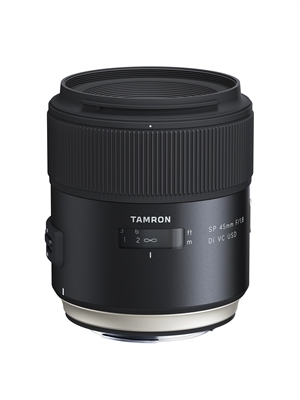 Slightly wider than the venerable 50mm standard focal length, the Nikon F mount SP 45mm f/1.8 Di VC USD from Tamron presents a unique perspective and pairs it with a sophisticated optical layout and VC image stabilization for enhanced image quality. One Low Dispersion element and two aspherical elements help to control a variety of aberrations and distortions for consistent and even illumination and sharpness, as well as reduced color fringing, and eBAND and BBAR coatings work to suppress flare and ghosting for increased contrast and color fidelity. A normal-length prime, this 45mm lens is designed for FX format Nikon F mount DSLRs, and is also compatible with DX models where it will provide a 67.5mm equivalent focal length.